Shahjahanpur is one of those typical, dusty, sleepy small towns that dot the North Indian landscape. The town was founded by Dilir Khan and Bahadur Khan, both of them generals who served in the court of the Mughal Emperor Shahjahan. It’s musical Gharana is one of the more well known ones, and the famous sarod player Amjad Ali Khan is from this Gharana. However it was during the freedom struggle, that Shahjahanpur had it’s claim to fame, as a revolutionary hub. Most of the revolutioaries in the North, were from this town. And among them, the most famous were two friends, whom destiny would bring together- Ram Prasad Bismil and Ashfaqullah Khan. Ashfaqullah Khan was born at the turn of the 20th century on October 22, while Bismil was born 3 years earlier on June 11, in the same town. Both of them were excellent writers in Urdu and Hindi. Both of them would come together under the Hindustan Republican Association, not to mention the fact that Ashfaq was an admirer of Bismil’s poetry, and became close friends with him on that account. And both these men were hanged on the same date, December 19, 1927 for their involvement in the Kakori conspiracy. Two men from different religions, different backgrounds, yet destiny would bring them together. Bismil’s ancestors hailed from Gwalior, and his native village was close to the Chambal valley. His father was a clerk in the Municipality, and later started a small business lending out money on interest. He taught Ram Prasad Hindi, and he later sent him to a Moulvi to learn Urdu too. By 14 years of age, Ram Prasad was fluent in Urdu, and read many novels. He learnt the rituals of worship from a priest near to his home and later learnt Sandhya Vandana too from Munshi Indrajeet. He was deeply influenced by Swami Dayanand Saraswati’s teachings and his book Satyartha Prakash. Ashfaqullah on the other hand, was the youngest of six siblings, son of Mohd. Shafiqullah Khan and Majroonissa Begum. While his father, came from a modest background, his mother came from a well off family, whose men were highly educated. However their support to the British angered the common folk, and their Kothi was ransacked and burnt down during the 1857 Revolt. He was introduced to Bismil’s poetry, through his elder brother Riyasatullah, who happened to be his classmate. The poetry of Bismil, so impressed Ashfaq, that he wanted to meet him as soon as he could. However Ram Prasad was absconding then for his involvement in the Mainpuri conspiracy. When Ram Prasad came back to Shahjahanpur in 1920, that was the time Ashfaq got a chance to meet him. Though he tried meeting Bismil many a time earlier, he could not. However one evening when Bismil was at the river,in a meeting with other friends, Ashfaq did manage to meet him. On knowing he was the brother of his classmate Riasatullah, and an equally good Urdu poet, Ram Prasad asked Ashfaq to meet him at Arya Samaj. The principles of the Arya Samaj had a deep impact on Ram Prasad, which was not to the liking of his father. He even ran away from home after an argument with his father, and was later bought back by his father’s friends. Interestingly Ashfaq’s family too was against him going to Arya Samaj, but he did not pay heed to their words, and went. After a rather long talk with Ram Prasad, Ashfaq became an active member of the Matruvedi, a party that was started by Bismil. And that put him on the road to the revolution. Ashfaq advised Bismil that along with their revolutionary activities, they should also be part of Congress party. Many youngsters of Shahjahanpur too joined the Congress. Bismil along with Ashfaqullah and another freedom fighter Prem Kishen Khanna joined the Congress in 1921. In 1921, Mahatma Gandhi called off the Non Cooperation movement and it gave an impetus to the revolutionary movement. This decision split the Congress into two groups, one headed by Gandhi, another by Chittaranjan Das. Later Das along with Motilal Nehru formed the Swaraj Party, while the youth rallied under Bismil. Around this time some of the youth of Bengal, requested Bismil to start a new party. His fame had already spread wide, due to his involvement in the Mainpuri conspiracy. However Bismil, was busy with his silk weaving factory, and felt he would not be able to devote time to it. It was Ashfaq again who convinced him to do so, and assured him of all cooperation. Bismil went to Allahabad in 1923, and drafted the constitution of the new party along with Sachindranath Sanyal and Dr.Jadugopal Mukherjee. On 3 Oct 1924, the Hindustan Republican Association was founded in Kanpur, with Sanyal as the Chairman and Bismil as the District in charge for Shahjahanpur, he was also in charge of the Arms. In fact owing to his organizational abilities, he was given the additional charge of Agra and Oudh too. Ashfaqullah was made Bismil’s deputy and it was up to these two to expand the revolutionary activity in the North. Kakori was a small village near Lucknow, and the 8 Down between Shahjahanpur and Lucknow used to pass through it daily. Ram Prasad decided to stop the train at Kakori and take away the money bags, this was the genesis of the famous Kakori conspiracy. Ashfaqullah though initially opposed the plan, saying it was too risky, and the Government would crack down real hard. However with others like Rajendra Lahiri, Thakur Roshan Singh going along with Bismil, Ashfaqullah too lent his support.
. August 9, 1925, evening time, along with 9 other revolutionaries, Rajendra Lahiri pulled the chain at Kakori station, while Ashfaqullah held the driver hostage with his Mauser pistol . While Ram Prasad Bismil pushed the guard down and looted the Government money from his cabin. However when none could break the safe, it was Ashfaq once again who managed to break it with all his strength. There was no bloodshed, except for one passenger killed accidentally. Soon the Government cracked down, on the Kakori conspirators and, and arrest warrants were issued.While Chandrasekhar Azad managed to evade the crackdown, Ram Prasad was arrested soon enough, while Ashfaqullah went into hiding for some time. Ashfaq spent some time in Kanpur, working in Ganesh Vidyarthi’s printing press. And for quite some time he wandered all over the North from Kanpur to Bihar to Rajasthan, changing names. He finally went to Delhi, and wanted to somehow escape India and meet Lala Hardayal. However he was betrayed by his own friend in Delhi, to the police and was arrested by Ikramul Haque. Tasadukk Hussain, the SP, tried to provoke Ashfaq, against Bismil, using the Hindu-Muslim angle, but he refused to be. To which Ashfaqullah relied back. “Mind your tongue, Panditji( which is what he used to call Ram Prasad), aim is to for the freedom of India. He is my brother. I would rather die under the rule of Hindus than to live under the British rule. You called him a Kafir, I request you to leave now, else another case of murder will be registered on me”. Finally Ashfaq was detained in Faizabad prison, his brother took the help of Kripa Shankar Haleja, a senior advocate. Others like Acharya Narendra Dev, Chandra Bhanpu Gupta, G.B. Pant too did their best to defend the Kakori case accused. In spite of the best efforts of Hajela, Ashfaqullah was convicted of conspiracy and sentenced to death. 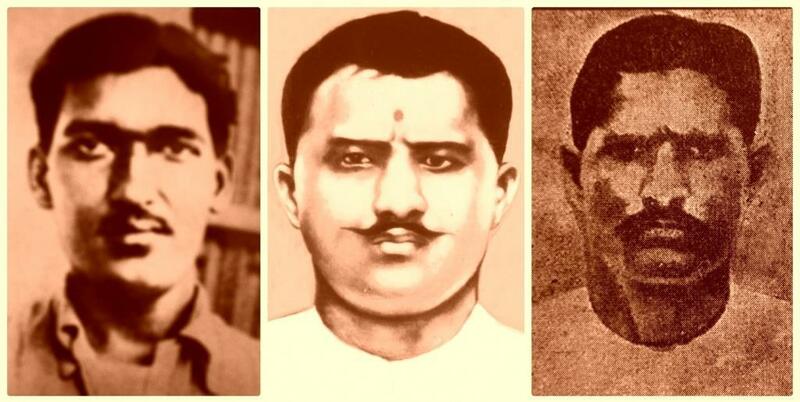 Ram Prasad Bismil, Rajendra Lahiri and Roshan Singh were also convicted to death along with him. The whole country protested against the death sentences. Petitions were made to the Viceroy to reduce their death sentence into life sentences. Even the Privy Council was approached. It was all in vain. It was during his stay in prison that Ram Prasad wrote his own autobiography, considered one of the finest works in Hindi literature. Though under strict watch in prison, he managed to successfully smuggle out copies of his manuscript in 3 instalments. The book was published in 1929, but was again banned by the Government. It covered his childhood, his ancestors, and his experiences with the Arya Samaj, along with more intimate portraits of his mother with whom he shared a close bond. At Faizabad, Ashfaqullah was put in solitary detention, where he spent time reading the Quran and doing the Namaz. During his confinement in Faizabad, he penned his own diary, apart from Urdu, was equally good in Hindi and English. But the most moving excerpt was in Ashfaq’s diary just the night before he was hanged. I shall go empty handed but with the pain, that when will Hindustan be a free nation once again. Bismil is a Hindu he says “I shall come, I shall come again and again, till I free Bharat from the foreigner”. I also wish to say the same as Bismil, but am bound by my religion. I am a Muslim, do not believe in rebirth; but if I meet Allah, I shall spread my arms in front of him, and ask him not for Jannat, but just one opportunity to be reborn again to free India. District prison, Faizabad. “My hands are not soiled with the murder of man. The charges framed against me are a bare false”- Ashfaqulla’s last words before hanged. He kissed the rope, and began to recite the Shahadat, as the noose tightened around his neck. Gorakhpur prison- Ram Prasad got up, had a bath, said his morning prayers and wrote his last letter to his mother. He walked without any fear to the gallows, completely at peace of mind, even the authorities were surprised. As he mounted the gallows, Ram Prasad shouted “Vande Mataram”, “Bharat Mata ki Jai” and recited the prayer “Vishwani deva savitaha dunitani”. Gorakhpur gave him a fitting funeral, with many breaking down seeing his body and he was cremated near the Rapti river. The two voices were silenced, but their spirit would live on. Two men from the same place, who became friends, united in death, their sacrifice would inspire countless others. Ram Prasad Bismil and Ashfaqullah Khan, the nation salutes you. This entry was posted in Hindustan Republican Socialist Army, Indian Freedom Struggle, Modern India. Bookmark the permalink.